Sparks was created in the early 20th century as part of the Union Pacific Railroad’s modernization of the Central Pacific line across Nevada. The old division point at Wadsworth, where trains were dispatched, crews changed, and locomotives were serviced, was being bypassed by a significant realignment of the railroad, and a new division point was needed. The site selected was the Mary Wall ranch, just east of Reno. Being close to Reno, the site was much more convenient for workers and their families, and it had plenty of space for a new, modern shop and large roundhouse. Union Pacific President Edward H. Harriman declined to have the new town named after him, so it was named instead for Nevada’s sitting governor, John Sparks. Before the birth of Sparks, the original Central Pacific Railroad skirted the swampy area of the Truckee Meadows by running to the north, along the alignment of modern Prater Way. To provide suitable dry land for the new railroad facility, 65,000 carloads of gravel and rock were hauled from a quarry near Patrick over a six-month period in 1903. The following year, a roundhouse — the largest west of Chicago — was built. Nearby was a large, new shop building, which housed erection bays and blacksmith and machine shops. The depot building was relocated from Wadsworth. And an enormous coal bunker was built to fuel the locomotives. The new facility assumed full operation in 1904. While the Harriman reconstruction of the Central Pacific involved some double track, the railroad across Nevada remained primarily a single-track affair for years to come. By the time Sparks was established, railroads were well versed in the dispatch of trains by the clock. Long before, it had been found that the only effective way to keep two trains traveling in opposite directions on a single track from running into each other was to carefully schedule that they each be at different points at a particular time. That, and by making sure every company clock and employee’s watch was set exactly the same. As a division point, Sparks became the nerve center from which trains were dispatched. The division of the railroad under its control ran by the beat of the Sparks office clock. 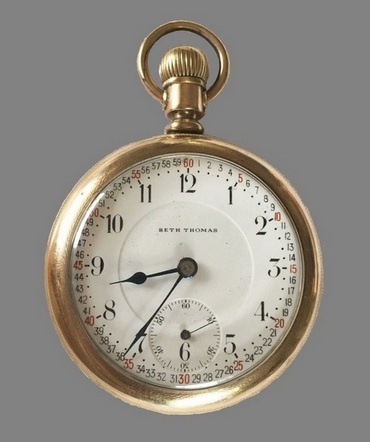 Highly accurate railroad watches like this one were carried by all SP conductors and engineers. As recently as two decades before the establishment of Sparks, clocks around the country had been set with reference to local noon. But by connecting distant cities, railroads underscored the fact that noon does not happen at the same time everywhere: true noon is eleven minutes earlier in Reno than in San Francisco. This really did not pose any particular problem in Reno, even though Central Pacific trains ran on San Francisco time. Though the Central Pacific and the local Virginia & Truckee followed different times, the railroads did not cross and there was no danger of a collision due to disagreement among the crews’ watches. However, in the East, where there were hundreds of railroads, each operating to the beat of their respective headquarters’ clocks, this created a serious hazard. Trying to coordinate the trains of two different railroads when their clocks didn’t agree was serious business. To eliminate this confusion, American railroads invented Standard Time, which divided the United States into four time zones with uniform time in each. Most railroads adopted this in 1883, and we still follow that system today. The adoption of this system had little impact in western Nevada, as the new Pacific Standard Time was based on noon at the 120th meridian, which is the boundary between northern Nevada and California (north of Lake Tahoe). The Central Pacific had to adjust its time 10 minutes ahead when it adopted Standard Time in November 1884, but this merely brought the railroad’s time closer to Reno’s local noon. Still, for most of the country, the adoption of standard time simplified life. Watches no longer had to be adjusted every time one visited the adjacent town. Only when traveling relatively long distances and crossing a time zone was a time change necessary, and then it was a matter of changing a whole hour, not a few minutes one way or the other. This was the situation in 1904, when Sparks assumed the railroad’s role of division point. However, as part of Harriman’s integration of the Southern Pacific (which by then owned the Central Pacific) into the Union Pacific system, the daily operation of the railroad east of Reno was turned over to the Oregon Short Line, a Union Pacific subsidiary. This company was based in Salt Lake City, which was in the Mountain time zone. To streamline train operation the OSL operated all the railroads under its control according to Mountain standard time. 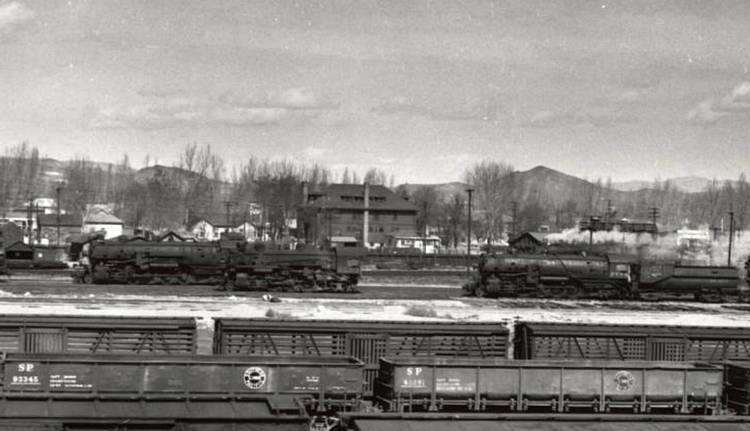 Accordingly, beginning in June 1904, trains heading east entered the Mountain time zone immediately after leaving Reno — at “Asylum Crossing” — a name it took from the nearby State mental health facility. Asylum crossing is now Reno’s Galletti Way. This put Sparks’ clocks one hour ahead of Reno’s clocks. But, since most of the railroad shop workers lived and commuted from Reno, the Sparks railroad shops operated on Reno — Pacific standard — time. Train crews and track crews, on the other hand, lived and worked by Mountain time. This occasionally confused travelers who happened to notice depot and office clocks on different times, but locals simply knew to pay attention to “fast time” or “slow time”, as the two times were called. This state of affairs persisted through December 1911 when the Union Pacific began to divest itself of the Southern Pacific and the world west of Ogden was restored once again to Pacific time. Steam locomotives were very labor intensive, requiring two-man crews for each locomotive and heavy periodic maintenance and repair. Accordingly, Sparks remained a railroad town only so long as the steam locomotives ran. The Southern Pacific began to phase out their steam locomotives after World War II, and by 1956 the railroad work force at Sparks had been cut from over 2000 to 85. The last steam locomotives left Sparks in July 1956. 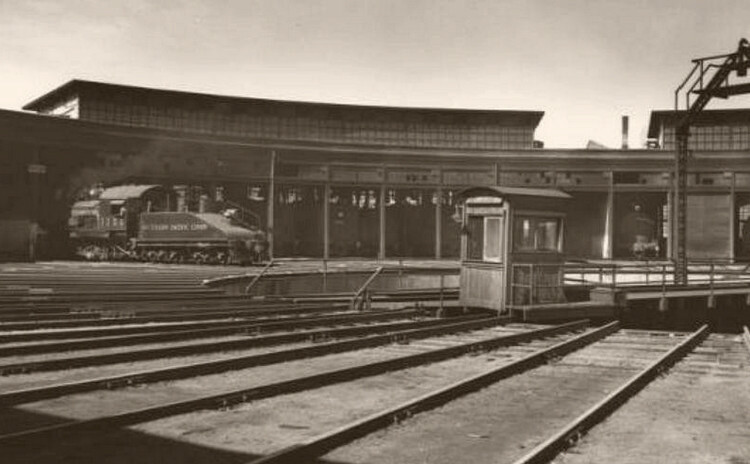 The roundhouse was soon razed. The adjacent shop building (which still stands) become a warehouse in September 1957. The old Wadsworth depot building continues to be used as the railroad’s office. And the railroad is once again the Union Pacific.